Triumph Of The Will / Olympia | Warped Factor - Words in the Key of Geek. Listen, don't mention the war. Chris Morley mentioned it once, but I think he got away with it. 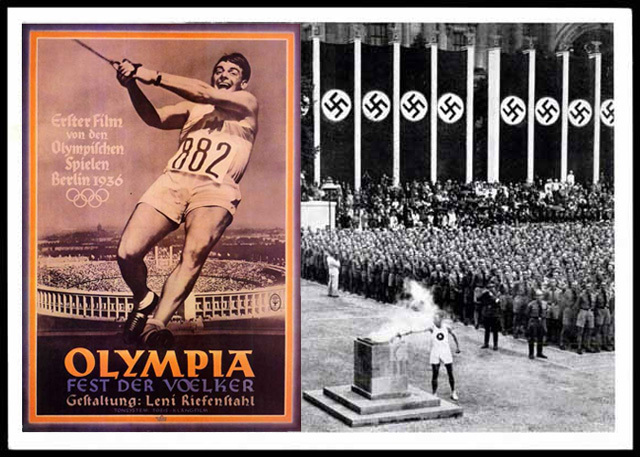 Much has been written on the role of the 1936 Olympics & its place in the public perception of Nazi Germany, & indeed Leni Riefenstahl's documentary Olympia, released two years after the event, can be seen as a sporting representation of its ideals. "At first glance, his compositions stand in the foreground of Triumph of the Will; however, they account for no more than a fifth of the total music in the film. In fact, the great majority of music consists of marches and (battle) songs, which may have been too “obvious” as to demand the attention of musicologists." The director herself had a strong view of the position of music within her works. Her early ballet ambitions probably also helped her appreciation of the role of sound once she moved into film-making. 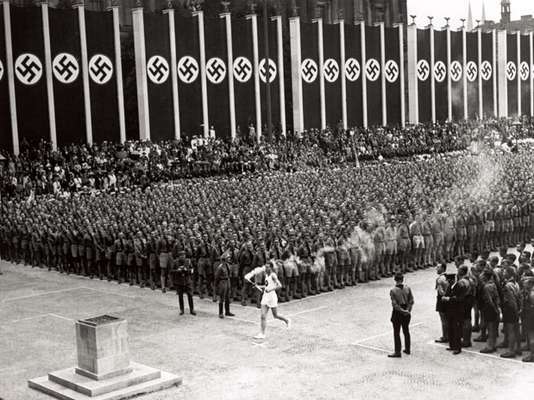 And in making Olympia she was able to document the first outings for several elements of the modern day Olympics, including the torch relay as devised by Dr Carl Diem, a top sporting administrator of the Third Reich. In its own history of the relay, BBC News put it in context. "The organiser of the 1936 Olympics, Carl Diem, wanted an event linking the modern Olympics to the ancient. The idea chimed perfectly with the Nazi belief that classical Greece was an Aryan forerunner of the modern German Reich. And the event blended perfectly the perversion of history with publicity for contemporary German power." "Olympia is such a striking piece of Nazi pageantry that it is easy to forget Adolf Hitler had not wanted to host the Olympics. Berlin was awarded the 1936 Games in the days of the Weimar Republic. Two years later, in 1933, Hitler came to power. 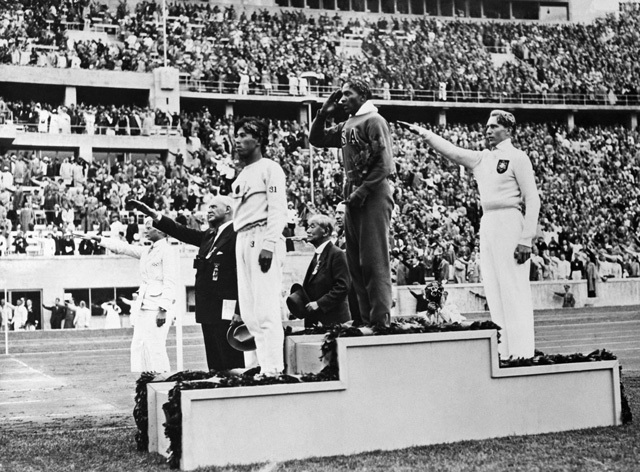 Olympian ideals of peaceful competition and internationalism repulsed the Nazis – as did the prospect of Jewish, Slav or black athletes competing against whites." And there's a chilling side to the images of sporting prowess! "Though these sporting images might in themselves have been neutral, their compilation in Riefenstahl's Olympia subtly underlined a tenet of all authoritarian regimes: that individuals must be turned into machines that act as required, but do not think. At no point do the sportsmen and women in Olympia speak." 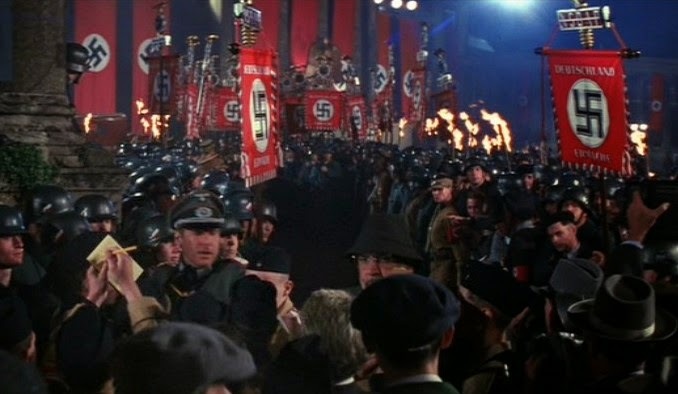 Riefenstahl would claim that the Reich had no influence on the finished film. Which is blatantly untrue! How is to be viewed from a sporting viewpoint? The Sport Journal can answer that. "On the surface, the film appears to be a very well made sports film, depicting outstanding athletic accomplishments by many individuals and teams from throughout the world." But even then a political undercurrent is obvious. And a key component of that is inherent in the music. "“Olympia” was considered a documentary, but in fact it incorporated two components generally unknown in documentaries typifying that time: editing and sound. Riefenstahl’s skillful editing allowed the most exciting moments to be featured and produced smooth transition between the sports events. In a most sophisticated manner, Riefenstahl also incorporated sound within the film, in the form of background music and narration. She worked tirelessly to synchronize music by distinguished film composer Herbert Windt with the moving images in the film. In those days, to attach any sort of sound to a moving picture was always difficult and often impossible, but Riefenstahl accomplished it with a flawless precision that impressed audiences and critics in Germany and abroad." "In truth her interest was born not of racist ends but of the delight she, as a former dancer, took in the human form." And she had plenty of licence. "Hitler gave Riefenstahl everything she needed for her production: finances, materials, manpower. Working with a massive production team, her budget of 1.5 million reichsmarks (rms) was later augmented by a further 300,000 rms. Backed by such resources, she could film with an omnipresent camera and then choose and edit from literally kilometres of film footage, all meticulously shot and edited to present fascism in the most positive light. The opening shots of the film immediately make this clear: a painstakingly contrived prologue harks back to the glories of ancient Greece and corresponds entirely to Hitler’s own efforts to ascribe to National Socialism a long historical tradition based on a mythical past."